An assortment of needles every household should have for those tasks when an ordinary needle is not enough. 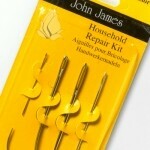 This kit contains a collection of 5 unique repair needles including curved and leather needles ideal for sewing into difficult and hard to reach areas. Be amazed how quickly a difficult task is made easier by using these needles.